Most of us are familiar with the most popular “headliner” rides at Disney’s theme parks; after all they are probably the main reason for visiting the parks. In this series, however, I will focus on some of the lesser known things to do inside the parks. This week’s entry is one of the first shops you can see as you pass under the train station and enter Town Square in the Magic Kingdom, and you may have never even noticed it: Harmony Barber Shop. 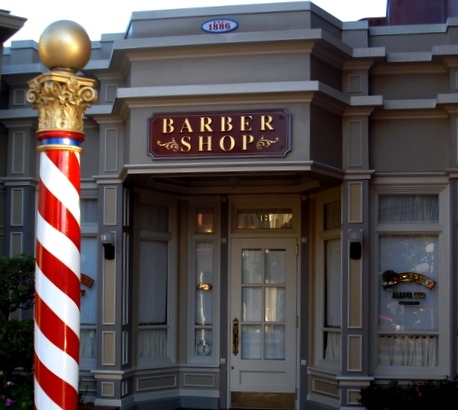 The Harmony Barber Shop is tucked away on the left hand corner as you enter the park just past City Hall & the Firehouse between the “car barn” (where the parade floats enter/exit) and the Main Street Emporium. Just like many of the shops on Main Street, this hidden gem is another throwback reminiscent of days gone by. This shop is just another touch that Walt Disney and his imagineers added to give Main Street the feel of a turn-of the century small American town. The shop is ornately decorated with three very comfortable vintage barber chairs and beautiful woodwork marble-topped cabinets around large mirrors. The term barber shop usually has a male connotation, but this shop is open to all guests from boys and girls getting their first haircuts to women who want a style or trim to men who want to trim their beard or mustache. The Harmony Barber Shop serves them all. 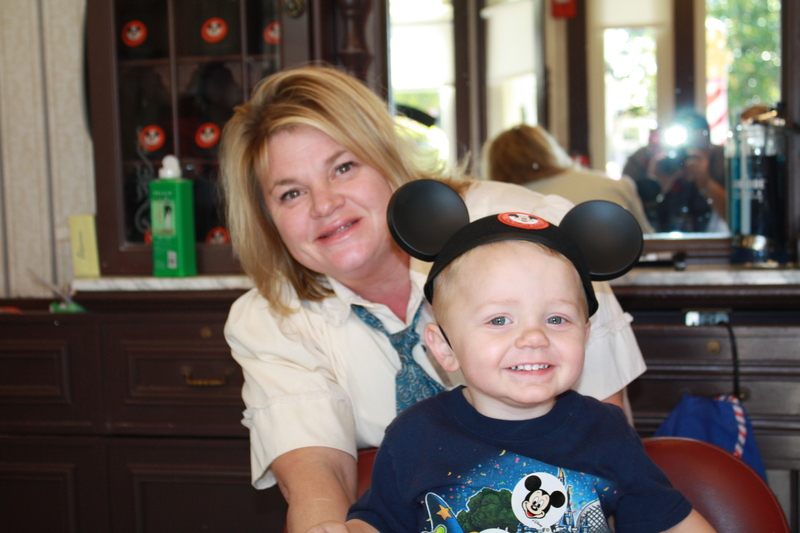 Check out all the Mickey stickers Jack got! 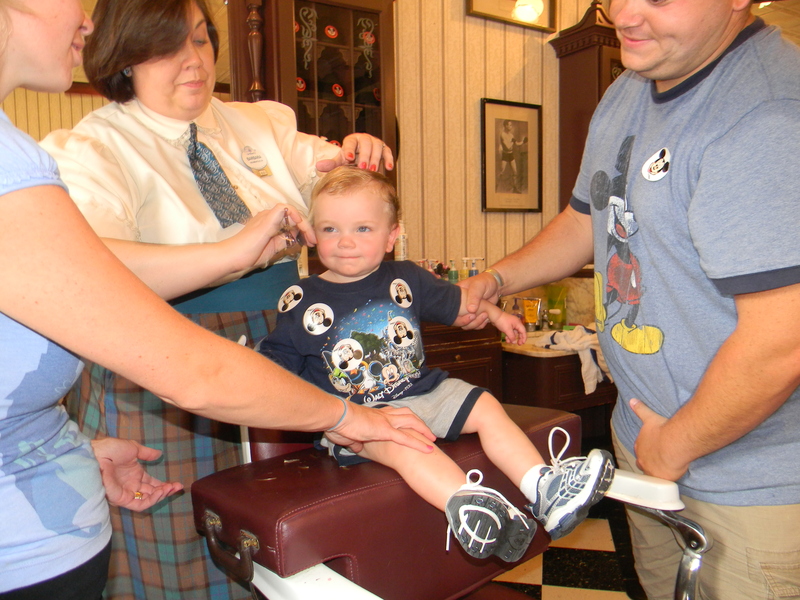 The “First Haircut” mentioned above is a specialty of the shop. 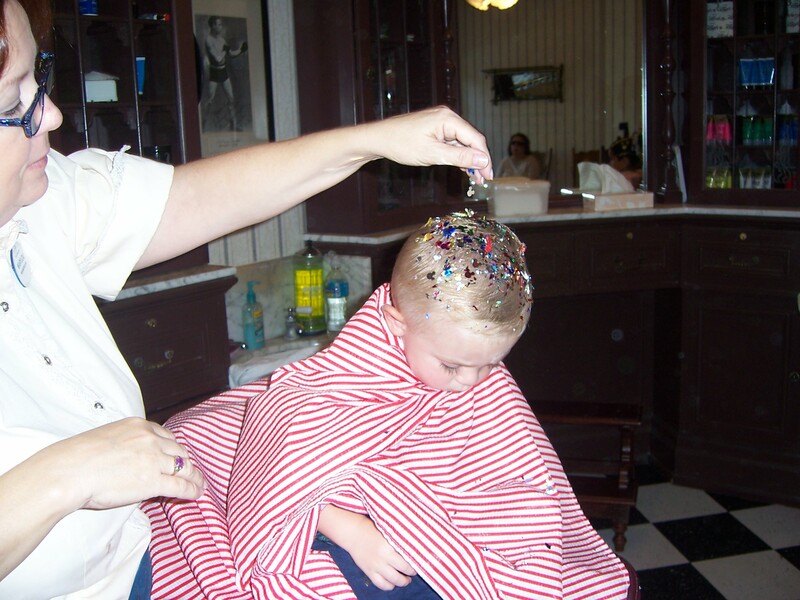 Young boys and girls who receive this experience are entertained by the cast member with Mickey stickers or bubbles or toys while they receive a very professional haircut and are sprinkled with pixie dust. 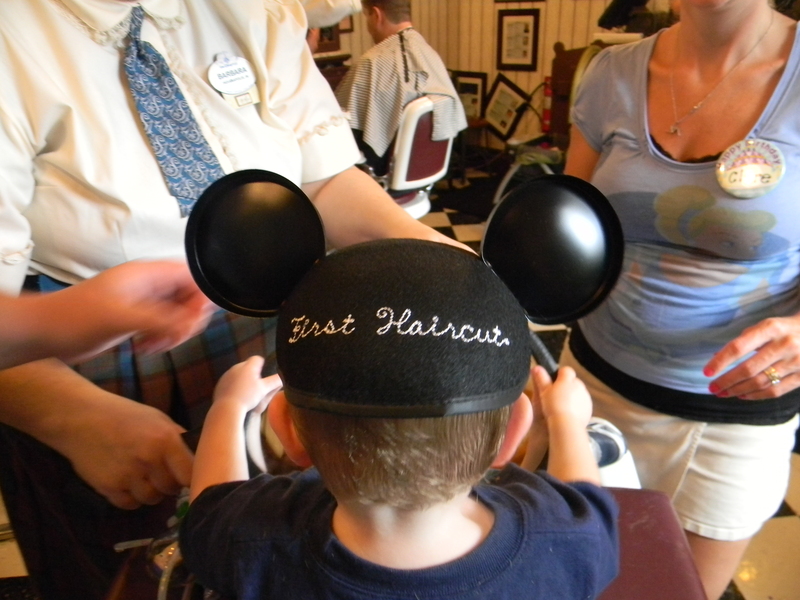 After the haircut they receive a set of “First Haircut” Mickey ears and a certificate along with a lock of their hair. At $18 this may be one of the best values in all of Disney. Even if you don’t need a full haircut, someone in your group might just want a trim or the kids may enjoy adding colored hair gel and pixie dust to their hair for a special look throughout the day. During your cut you may even be lucky enough to be visited and serenaded with a song by the Dapper Dans (Disney’s famous Barbershop Quartet). They visit the shop throughout the day, so make sure you keep an ear out for them. Although the shop does walk-ups, we recommend making an appointment given that the shop is small; and after all who wants to wait in line? A haircut at Harmony early on in your stay will start your vacation off right and make you look great in all of your photos throughout the remainder of the trip. 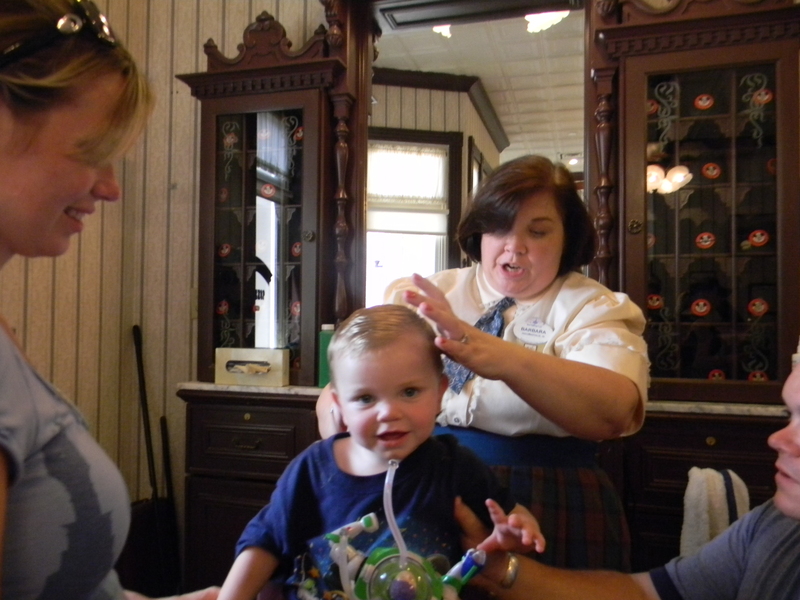 So next time you are planning a trip to Disney World, make sure you book an appointment at one of Disney’s hidden gems: The Harmony Barber Shop. 9 a.m. to 5 p.m., seven days a week.